In the city of Nairobi, Kenya in February of 1996, David was born. He was born in the slums, fatherless due to the AIDS disease and the fifth child in his family. Soon after his birth, his poverty stricken mother suddenly abandoned him and his siblings. At that time, he was just a baby, and helplessly alone. As an abandoned infant, David's grandmother raised him as much as she was finanicially able. When she could no longer afford to keep him, however, David was forced to live on the streets. He had no other relatives to turn to, so he joined the thousands of other children on the streets. He was only five years old. On the streets, David had to scrounge for food from burning trash heaps and to sleep on street corners and in alleys. Though born the fifth child in his family, sadly, he is the only one still living. Never had he felt more alone, more worthless, more abandoned. It is only by God's grace that he survived that way for several years. Thankfully, and by God's continuous grace, David heard about Gethsemane. Hoping for any help he could find, he finally came to us when we started our day school. Never having gone to school before, David struggled at first. But he soon began to improve in his studies and moved to our Gethsemane home. Also, David had never heard the gospel of Jesus Christ before. While at our home, he heard the stories of Jesus over and over again. One day, he decided to give his life to the Jesus he was hearing about. Praise God, David is now a born again Christian! Since being at our home, David has learned to enjoy reading, something he never would have been able to do before, and has developed a love for God and His word. 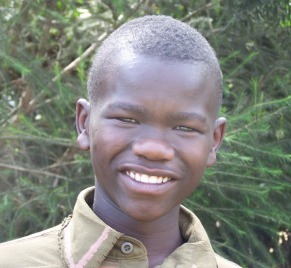 He is also very talented athletically and enjoys playing soccer with the other Gethsemane boys. The transformation in David since accepting Christ is undeniable! Please pray that we at Gethsemane will be able to grow and share the gospel with more children struggling on the streets like David did. Copyright 2018 Gethsemane International, Inc.